Verilog for Design & Verification (VG-VERILOG) course is structured to enable engineers develop their skills in full breadth of Verilog Constructs in Complex Design implementation and Directed testbench Setup. 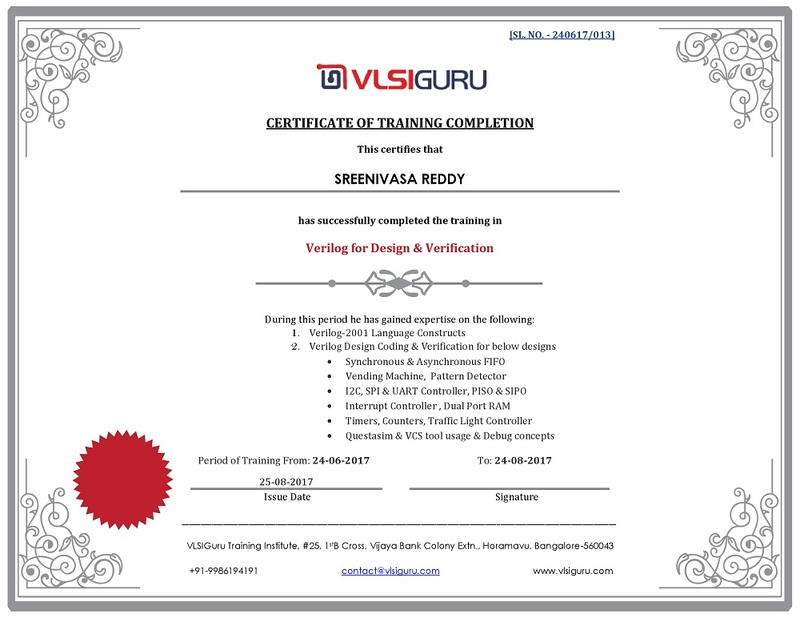 VT-VERILOG course is targeted for both design & verification engineers who want to gain expertise in using Verilog for design & testbench development. Course will also focus on Advanced Digital design concepts & Basic Analog design concepts. VG-Verilog course is a 5 week course to ensure that student is completely prepared with all Verilog, Digital & Analog design concepts, before he start looking out for job. Saturday & Sunday(8:30AM – 4:30PM India time. Monday to Friday(9:30AM to 12:30PM). Flexible lab sessions for US Students. Weekdays sessions will be focused on training on Assignment solving sessions; evaluation tests; and labs. Students also get support on complete project flow during weekdays as well. Does course cover practical sessions on UVM usage? Student will get access to assignments, labs, session notes, interview questions, sample resumes on course page.